Randomman295 wrote: Didn't Universal Studios Japan do something like this with their spinning coaster? I'm glad to see that more parks are catching on to this. Interactive queue elements have been around for awhile (think Indiana Jones and the rope in the well/shaking the bamboo, or the Revenge of the Mummy rides having some gags as well), but Disney is just now taking it to the next level. Very cool stuff! Are you ready to experience a whole new pirate adventure? Walt Disney Imagineering just shared a sneak peek at the new interactive quest, A Pirate’s Adventure: Treasures of the Seven Seas, which will debut at Magic Kingdom Park this summer. In the game, the fate of piracy in the Caribbean rests in the hands of new pirate recruits, who, armed with magic talismans and treasure maps, embark on five different pirate raids throughout Adventureland to collect valuable treasures, while Captain Jack Sparrow’s magic compass guides them. Here, Imagineers Jonathan Ackley and Matt Beiler offer up a look at a few of the quest’s cool special effects. A Pirate’s Adventure: Treasures of the Seven Seas will be included with Magic Kingdom Park admission and is open to guests of all ages. Now, which of you are ready to join the ranks of a new recruit? Loved the Kim Possible game at EPCOT, looking forward to trying this out later this summer. ^I agree. I really liked the Kim Possible game. It was a great way to pass the time mid-day when all the lines were really long, or while waiting for a magic ruining Fast Pass. I love Disney and all the little details they put in their queues especially while queuing for BTMR so an addition to these queues is a good thing in my opinion. On my last visit I only saw the upgrades to Winnie the Pooh and Space Mountain and thought they were brilliant. Bring on the next upgrades Disney. Just seconds ago, a 180-foot-tall Mike Wazowski from the upcoming Disney●Pixar film “Monsters University” made the official announcement that we’re keeping three theme parks open for 24 hours on Memorial Day Weekend, the traditional start of the family travel season, to kick off a Monstrous Summer on both coasts. Wazowski, the loveable green-bodied, one-eyed monster, joins best pal James P. Sullivan (“Sulley”) in the prequel to “Monsters, Inc.”, this summer as college students with hopes of becoming Scarers. Okay, okay, Disney - you win. Gonna make it the whole time this year, Adam? 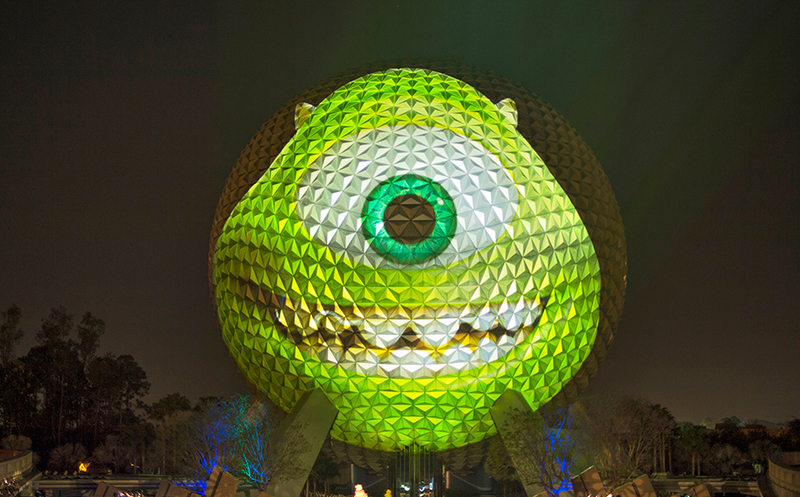 That Mike Wazowski projection? Too cool. Shame I won't be able to make this one (yet again, distance separates us, Disney) but I'm glad to see they're expanding this one to DCA as well! Hopefully we'll see EPCOT or DHS involved in the next one. TheStig wrote: Gonna make it the whole time this year, Adam? LOL! I was just going to say the same thing! I also can't wait to see the limited edition cupcakes that cost about $10 each and take about 2 hours to find! I feel like I should go again since I did the one last year. I should also get a medal that I can wear around everywhere since it's so difficult to do.